The Eaton Power-Sure 700 combines voltage regulation with a transformer and filter to remove transients and noise. The combined effect is a regulating and shielded isolation transformer system that solves 99 percent of electrical disturbance problems, including electrical brownouts, sags, surges, transients and other electrical disturbances. It provides power protection using Eaton’s three-phase product line conditioning system. 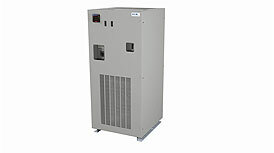 Power-Sure 700 combines voltage regulation with a transformer and filter to remove transients and noise.